I was really looking forward to getting out the pond again as it’s been fishing really well with some cracking weights of bream and skimmers along with lots of quality roach and rudd. There was a good turnout at the pub with thirteen anglers fishing including Paul Homewood and Jamie Parkhouse who were fishing the pond for the first time today. There should have been a couple more but Hurf had to pull out as he hurt his back loading the dishwasher! and he was supposed to be picking Rich White up, I did offer to give him a lift but Hurf said Rich wasn’t too worried and would have the day off. Scotty Russell also phoned to say he was running late and he would meet us out the pond, after a coffee and a sausage sarnie it was time to draw, I pulled out peg 14 on the bottom bank which I was quite pleased with, somebody drew for Scott and pulled out in form peg 1 which won the last match with 31lb. The level of the pond was several feet down as the farmer was irrigating his spuds but it doesn’t normally affect the fishing. The wind was blowing into my bank and I really thought I’d be in for a good day. Today I was trying the Bait-Tech Pro Natural Bream for the first time and it smelt gorgeous, with a definite hint of caramel to it, leaving it to fully absorb the water I set my rigs up. Rig number one was a 0.5 gram Drennan Roach float with 0.10mm bottom and size 18 B611 and my other rig was a little Preston Chianti with 0.10mm and a size 18 Middy 63-13 hook to fish shallow. I was ready in plenty of time so walked up to have a chat with Bob Hammond and Steve Parker on the two pegs to my right and of course arranged my usual side bet with Steve. Back on my box and Paul H and Jamie P both shouted over that they wanted a pound on it as well. Rob shouted the all in and I cupped in three balls of groundbait containing some casters, hemp and maggots on the 10 metre line. It took a while to get a bite before I had a couple of roach, next chuck I’ve hooked what felt like a much better fish but turned out to be a foulhooked 10oz skimmer, still very welcome though. I carried on catching roach and also had a lovely little tench of 6oz or so. After an hour I had 30 fish for around 3-4lb and felt I was doing okay. Big Frank up on peg 4 had netted a couple of skimmers on the feeder and Jamie P on golden peg 22 had netted a couple of better fish but I hadn’t seen a lot happening around the pond, Paul H did lose a decent tench at the net. Going into the second hour, I tried my shallow rig to see if I could get some better roach, I caught quite well for 30 minutes but then bites tailed off and I stuck with it too long really, I added another 23 fish in the second hour but sport really started to slow in hour three and I think I only added another 17 fish. 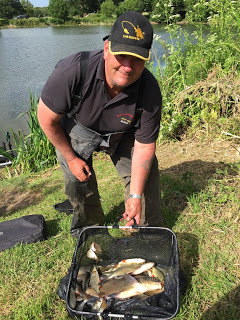 Frank was still getting odd skimmers on the feeder, Fieldy in peg 19 had landed a couple of skimmers but had lost a big fish after playing it for ages but then not long after he landed a perch that had to be getting on for 3lb and Paul had netted a big slab. I was back on the deep rig and catching small roach but I just couldn’t get any quality. With two hours of the six left, I was struggling when out of the blue I’ve hooked a good fish that tore off with yellow hydro streaming out of the pole tip, the fish stopped and then kited to my right before stopping and I gained some ground on it, I could see a fin and think it may have been a decent perch, I unshipped to the top two and could see my bulk shot when the fish made another run and the poxy hook pulled out – great! 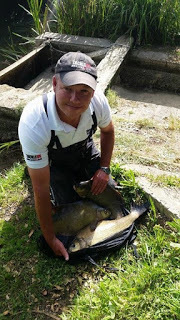 Jake Woodard up on peg 23 deserves a mention as he was fishing 16 metres towards the bush by peg 24 and landed a couple of big chub which he had to get away from the bush and then steer them around a massive irrigation pipe before netting them! With an hour left I went back out on the shallow rig and again had another really good half an hour where I caught some quality roach and rudd before the bites faded and I just added odd fish up until the end of the match. I ended up with 136 fish which would give me around 16lb if they averaged 2oz apiece but although I’d had some net roach and rudd, I’d also had a lot of smaller fish. The scales started with Fieldy who had an excellent 18lb 9oz, before Paul H had 13lb 15oz and Jamie P had 15lb 8oz and the weights were all very close. 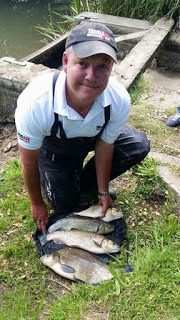 We got to Jake who pulled his net out and he had a big bream and some skimmers to go with his two chub and weighed 18lb. Then it was my turn and I was disappointed to only weigh 13lb 12oz and I needed a couple of those bonus fish. Bob had a few skimmers for 4lb 2oz and Steve P had 8lb 12oz so I won his pound but still ended up 2-1 down on the day. 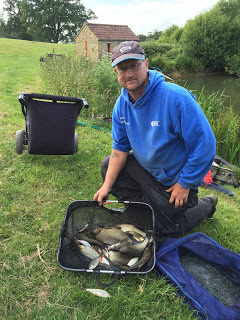 Scotty won the other section and the match with a fantastic 33lb 15oz, he had four bream, three chub and 8lb of roach, he also lost three bream which he thinks were foulhooked. Stu Alford was second with a bream and skimmers for 19lb 2oz on the feeder from peg 8 and I thought he’d been struggling! Big Frank won that section by default with 17lb 12oz of mainly skimmers and once again the pond had fished it’s head off with most people catching double figures. 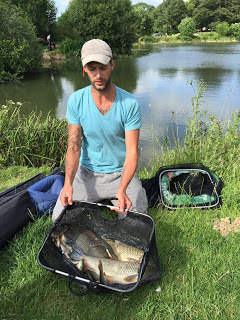 Scott with his three chub and one of the bream…. After four matches and dropping the worst result, Fieldy leads with 4 points followed by Frank with 5 and Stu with 6. Update – apparently this year you can drop your two worst results which means Scotty and Fieldy lead with 2 points followed by Frank and Ashley with 3. The weights are fantastic and the pond just seems to fish better and better every year, there seem to be loads of skimmers showing and for the first time in all the years I’ve fished it, the bream are showing in numbers. I must admit when I got home I felt at a bit of a loss as to how I would fish the pond next time, normally 18-20lb of roach will be there or thereabouts but I just couldn’t keep those better roach coming and bonus fish are playing a bigger part this year than ever before. I suppose I wasn’t actually that far away today, I just needed a couple more of those skimmers (and not losing that good fish at the net would have helped! ).